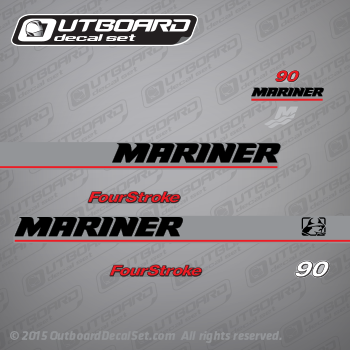 Mariner outboard decal set replica made from 2001 Mariner 90 hp from European 2000 2001 2002 2003 outboard cover. Mariner 90 hp ELHPT 4: 1F90411WD. Mariner 90 hp ELPT 4: 1F904123D, 1F904123N, 1F90412AC, 1F90412AD, 1F90412AN, 1F90412WD, 1F90412WN, 1F90412WR, 1F90412YD, 1F90412YE, 1F90412YN, 1F90412YR, 1F90412ZD, 1F90412ZN, 1F90412ZR. Mariner 90 hp ELPT-CSTL4: 1F90412WY. Mariner 90 hp EXLPT SW 4: 1F904223Y, 1F90422AY, 1F90422YY, 1F90422ZY. Mariner 90 hp ELHPT: 7F90411JD. All other hp and Red set version available upon request. this set with little variations may work on 75 hp, 90 hp and 115 HP covers with part number: 827328T10 TOP COWL ASSEMBLY (SILVER) from 2000, 2001, 2002, 2003, 2004, 2005 and 2006.